Combine bacon, onion, cheddar cheese and set aside. Combine beef, seasoning and beer; mix thoroughly. Shape into 6 thin patties. Put bacon/onion/cheese mixture on 3 patties. 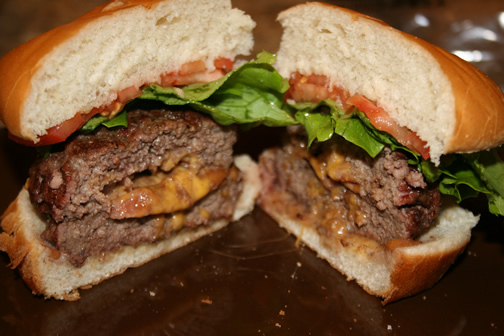 Top with remaining patties and press edges to seal. Grill, broil or pan fry until well done, about 4 minutes per side (I grill them). Wow! Your menu sounds great!